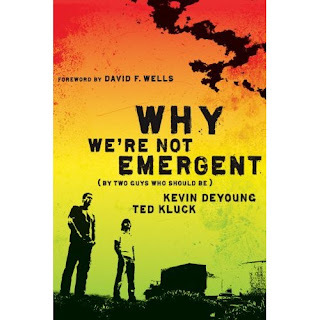 Wes Ellis: Book Review: "Why We're Not Emergent"
Book Review: "Why We're Not Emergent"
I just read the book Why We're Not Emergent (By Two Guys Who Should Be) and I can say It's not worth reading all the way through. but you should read the first few chapters to get a feel for it. I think you'll find that the sub-title should be "...by two guys that just aren't and don't even fit the mold" rather than "...by two guys who should be". I don't know if it's because they didn't bother reading the philosophers who influenced guys like McLaren, Tomlinson, and Bell or what, but these two authors are not in a good place to critique the so-called "Emergent movement" because they just don't process things the way McLaren and Bell do. Frankly they don't seem to even understand how Emergents could come to their conclusions. The more "academic" and theological of the two authors (someone of the Reformed tradition) is the least fair of the two insofar as he often takes quotes out of context by bloating them to say more than they originally meant to. He also takes obvious assumptions into his critiques. For example, when he dives into the argument about inerrancy he seems to assume that it's only Emergents who have quarrels with this word. In fact, there are many people, not just young emerging folks, who have come to the conclusion that the word inerrancy is at least misleading. This author never discusses the ways in which the term inerrancy has been misleading and taken advantage of in the past. He also assumes that objectivivity is the only way something is really true and that everything that is not "objective" is therefore superficial at best. But he never argues how objective truth can possibly work in practical life. He also, for another example, assumes simplicity in propositions. That a proposition is either true or false and he never entertains the idea that propositions are meaningless without stories, without context. He also assumes that if you don't like propositions then you don't like exegesis. He runs with this argument by quoting McLaren, someone who holds biblical scholarship and exegesis in high regard. I like the other author, the journalist, much more. He doesn't think like an emergent either, in fact he's just fine with beign and evangelical so, once again, I don't think he's in a good place to critique the Emergent movement. His critiques are more practical and down to earth and they come accross much more raw. But once again he seems to be one who doesn't really cling to anything, so he shouldn't be expected to cling to an author like Rob Bell, in whom he seems to go out of his way to find contadictions. Reading his chapter on Velvet Elvis is like reading a manifesto on all the ways one could possibly misunderstand Rob Bell. Overall I thought this book was less than helpful, in fact not something I would recommend to anyone who is trying to understand the Emergent Movement. It will likely be confusing if you read Bell and then read these guys critiquing Bell since they don't seem to understand him themselves. Forgive me, but this almost sounds as though you're saying only people who are actually in the emergent movement are qualified to critique it. Well, I don't mean to sound that way. I just think people who can relate with what they are saying are in a much better place to critique it. People who think within a similar framework will be better equipped to fairly represent what the emergent message really is and critiques can be made from there. It's just that these two guys don't understand the emerging church, they are obviously misunderstanding particular arguments that are being made. Fair enough. That makes sense. Thank you.